Bruce Drogo was looking for a way to mix martial arts and fitness. The result was a unique training variation that allowed his idea to thrive. Fitness is all about a fight between your body and the voice in your head. You can do more, or less, depending on how much fight you have inside you. The MMAXOUT Fitness experiment asks its members to prepare for that fight with fighting. It blends mixed martial arts and fitness. The workouts are extreme, and remarkably, can be performed by anyone with the desire. No, you won't get knocked out, but you will grapple, wrestle and infiltrate your athleticism with slices of jiu-jitsu. If you have the fight, they have the venue. Join us in congratulating MMAXOUT as this month's Bodybuilding.com Gym of the Month! 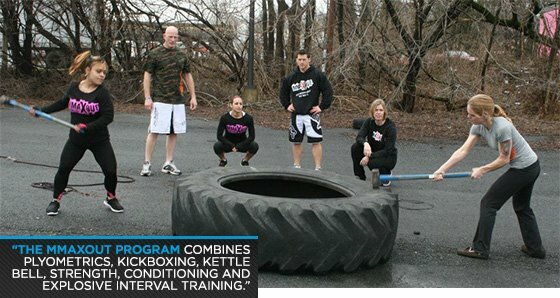 Hours of Operation: 5 a.m. - 9 p.m.
We organized this program to incorporate mixed martial arts with an extreme workout. With these intense workouts, results are guaranteed. 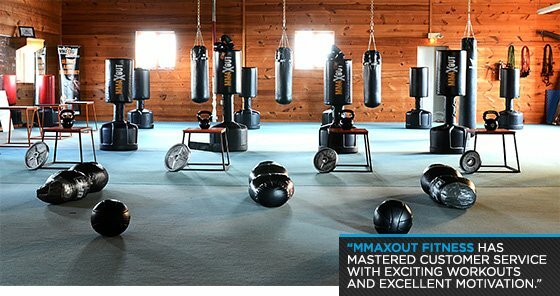 The name of the business defines the workout program: Mixed Martial Arts + Extreme Workouts = MMAXOUT. In less than one year of operation, we outgrew our location and are expanding to a 10,000 square foot gym. Plus, we licensed our program and now have 54 locations worldwide. I had a vision of teaching MMA as a fitness program to show everyone it's not only about fighting, but it's an awesome full-body workout. No one has done what we have, we traveled all over the country for two years learning and doing different programs. Our gym is like none other, it just works so well and the results show it. This is not your typical gym. This is a training facility with professional trainers who push each person to their max. Each trainer and each client provides the positive attitude and comfortable atmosphere. People look forward to coming and working out. It's their escape from the real world. Everyone motivates each other and helps one another with exercises. This gym attracts all types of people. The age range goes from 16-year-olds to 70-year-old people. There are clients who have lost 125 pounds and clients who just want to tone and become stronger. This training facility is for everyone with all training ability and people who have no experience whatsoever. Each person is there for one reason and that is to be healthier and for results. Results. With just taking two classes, you will feel 100% different than just going on a treadmill or elliptical. The diversity of each class is designed to work all muscle groups. And trust me you feel it. The MMAXOUT program combines plyometrics, kickboxing, kettle bell, strength, conditioning and explosive interval training for a workout that is sure to make you feel the burn. Commitment! We are here for our members. The MMAXOUT fitness staff and instructors believe in commitment as a daily growth for business. We have so many I am unable to list them all on here, it's awesome how so many members change their lives for the better just becoming healthier and enjoying our workouts ... I just want to say awesome job everyone. Controlling all the member sign-ups that flooded our gym as it grew as fast as it did. We don't sell our program, we show it. We offer one free class and people join right after. They love the workout. It's something they never did before. MMAXOUT Fitness has mastered customer service with exciting workouts. We also provide excellent motivation, which is the vital key to keeping members coming back for more, and bringing in their fit friends too.